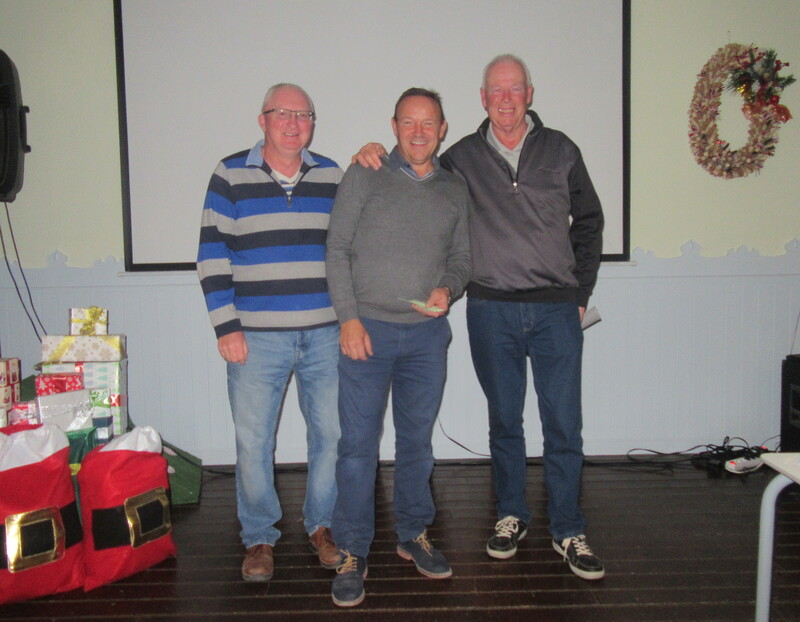 The last competition of 2017 was a pairs event – Dave Wareing and Kevin Watson were the best on the day but you don’t always need a partner to get in the prizes! Tony Andrews didn’t have a partner and had to rely on the luck of the draw, but his ‘ghost’ had one of the best scores, so always keep going! I was lucky enough to have 15 years old Megan Williams as a partner – surely the biggest age gap of the day, with me being 56 years older! She plays for Lancashire girls and surely has a bright future. She pointed out that her society handicap was 8 shots higher than what she plays off at home so asked for it to be reduced. 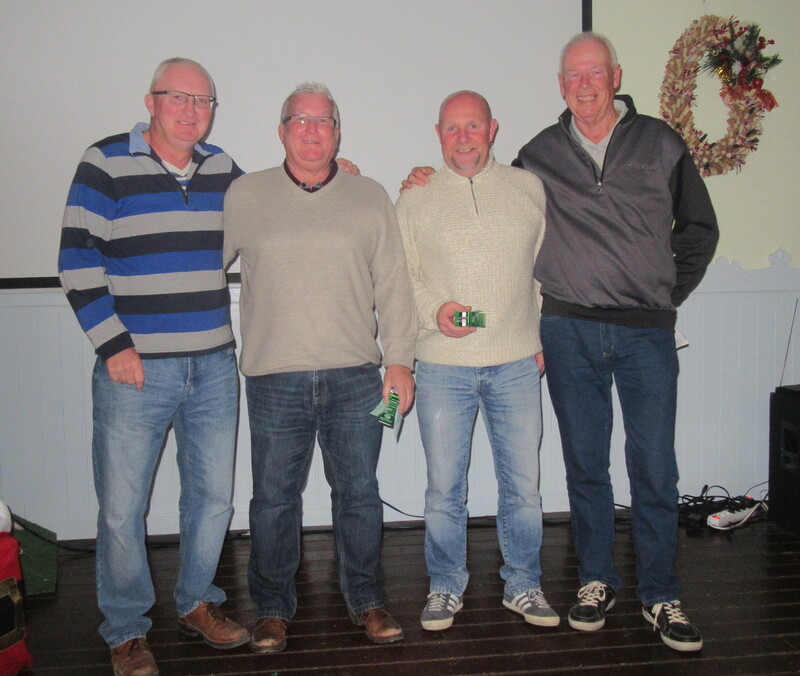 It maybe cost us a prize as we were only 3 strokes short! 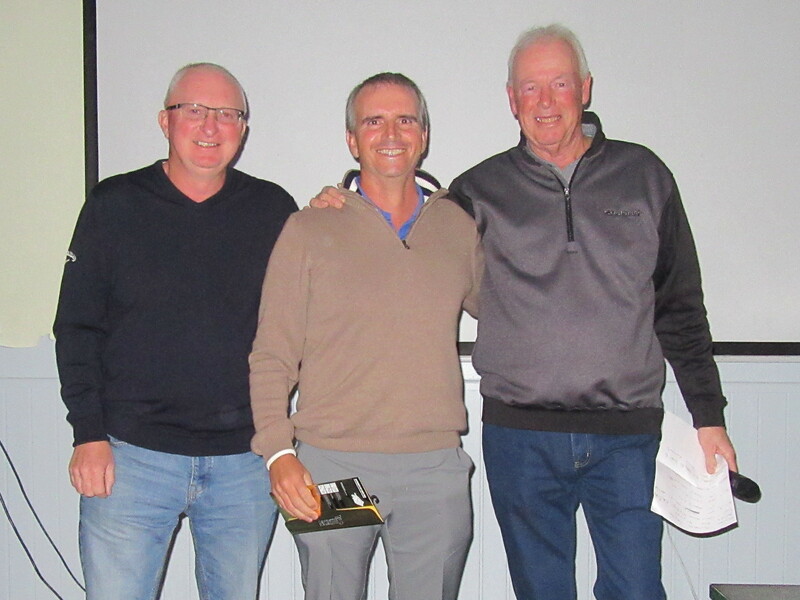 the coaching has produced a lovely swing……………………..
a drive, an iron, 2 putts – an easy par for Megs on our dreaded 10th hole…………………..
You can find a simplified explanation of the 2018 green fees on the CDA Golf Society (group) page on Facebook. Next week is the first Apollo Air stableford of 2018. 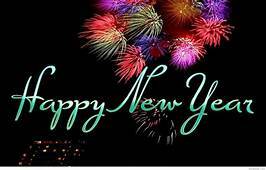 Wishing a happy and healthy new year to all our members. 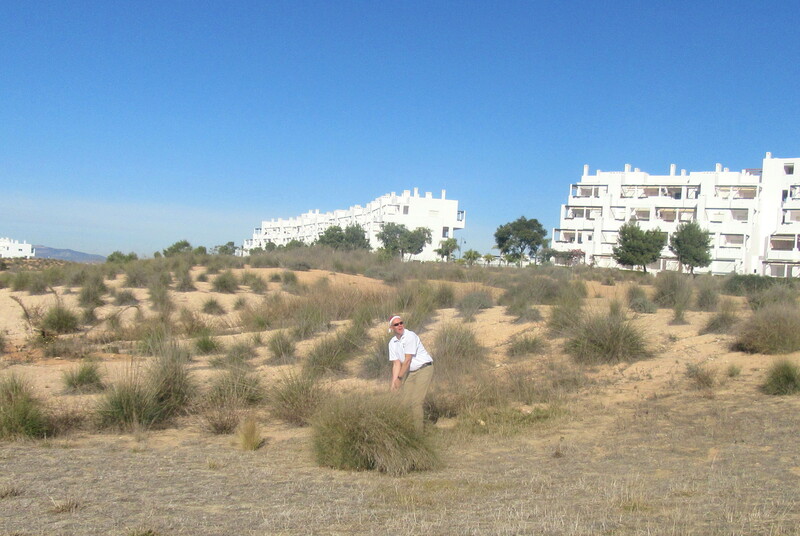 Green fees do not include the €3 daily license fee for non Spanish Golf Federated players. 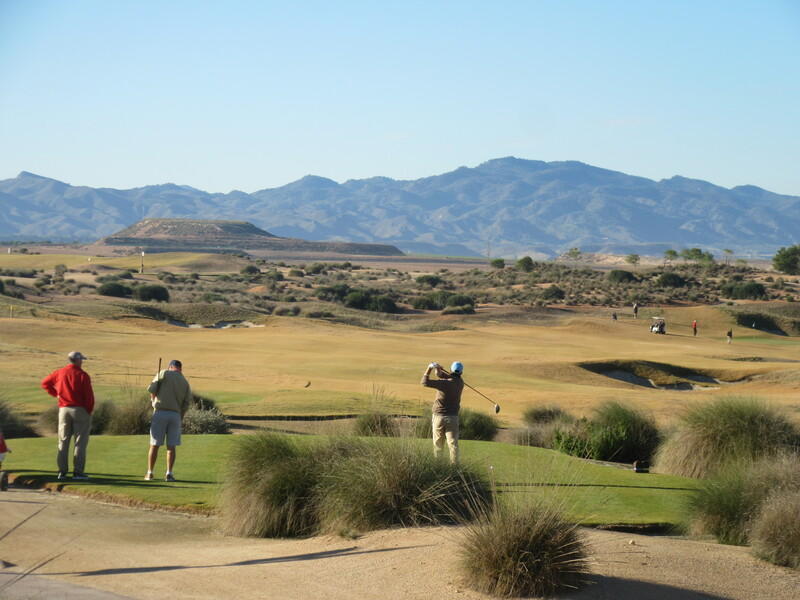 Golf Society rates only apply to groups of 12 players or more. Non GNK Golf members paying the society rate sharing a buggy. 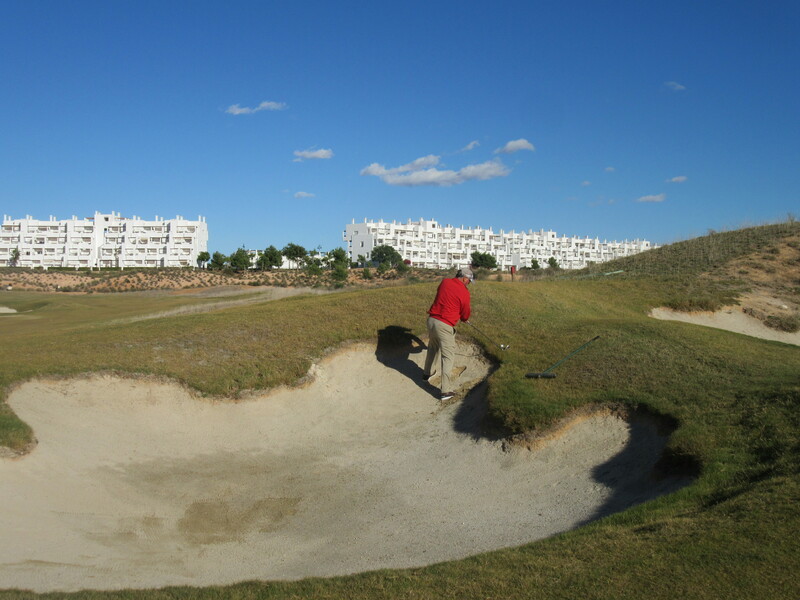 GNK Golf members and society players who wish to share a buggy. 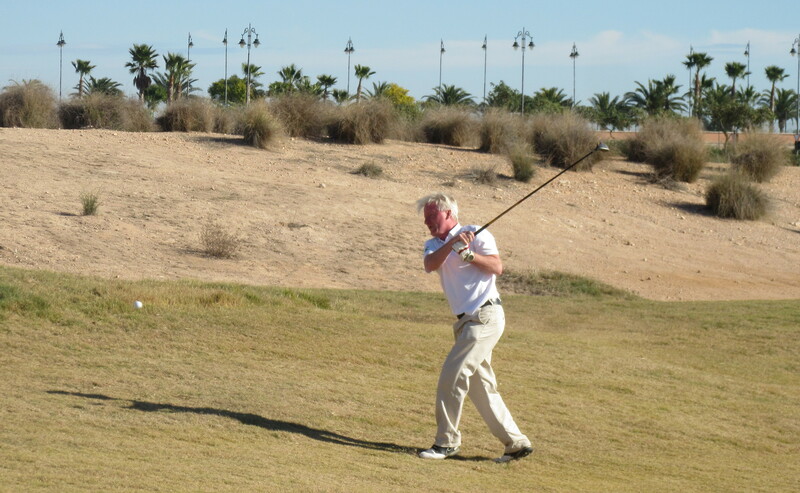 Tony Andrews shows that it’s not about the clothes, it’s the swing….. 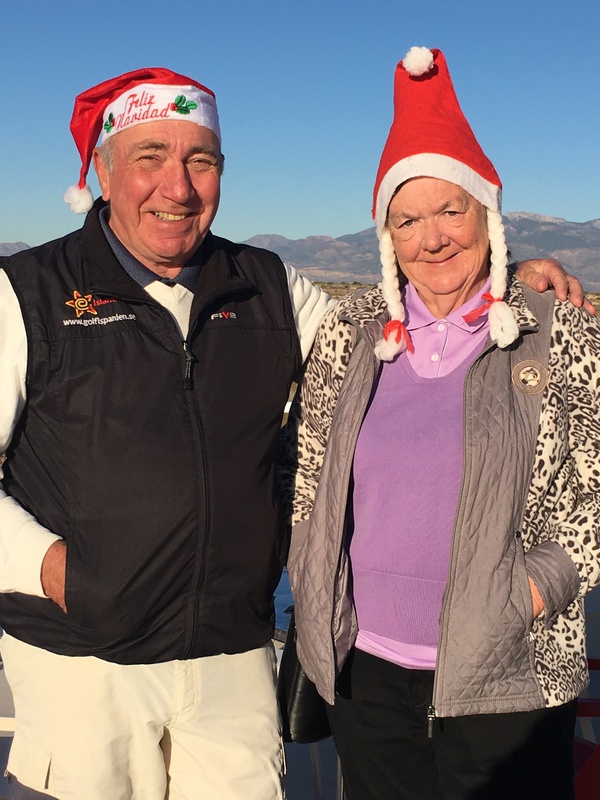 This week was the annual Clover Xmas special, a stableford with a twist – 2 gifts from Santa, one free throw at any time during the round and a mulligan (replay one shot you weren’t happy with!). 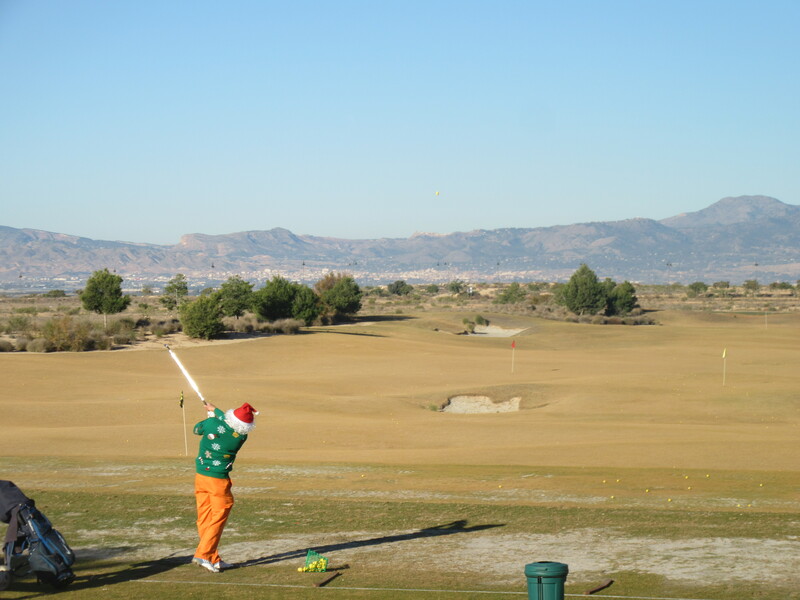 Players wore Santa hats (provided if they hadn’t got one!). 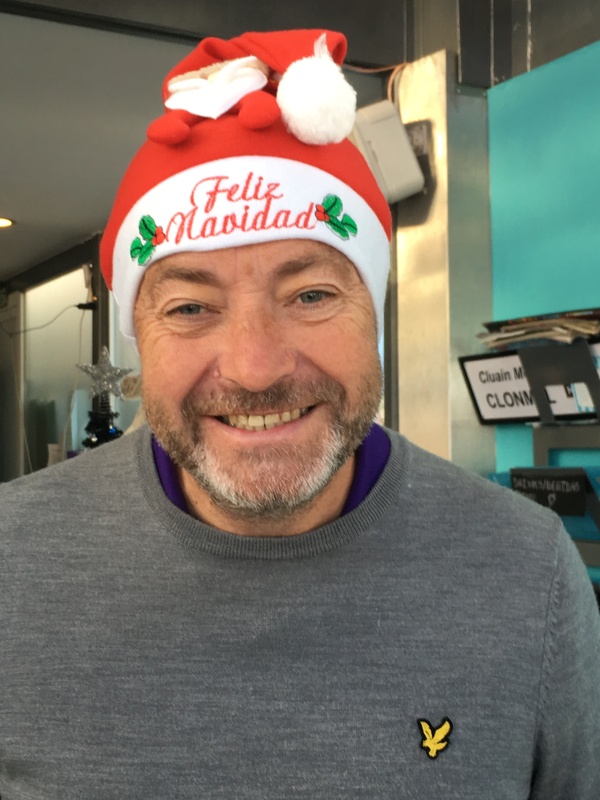 Peter Reeves got into the Christmas spirit, dressing appropriately for his role as starter. 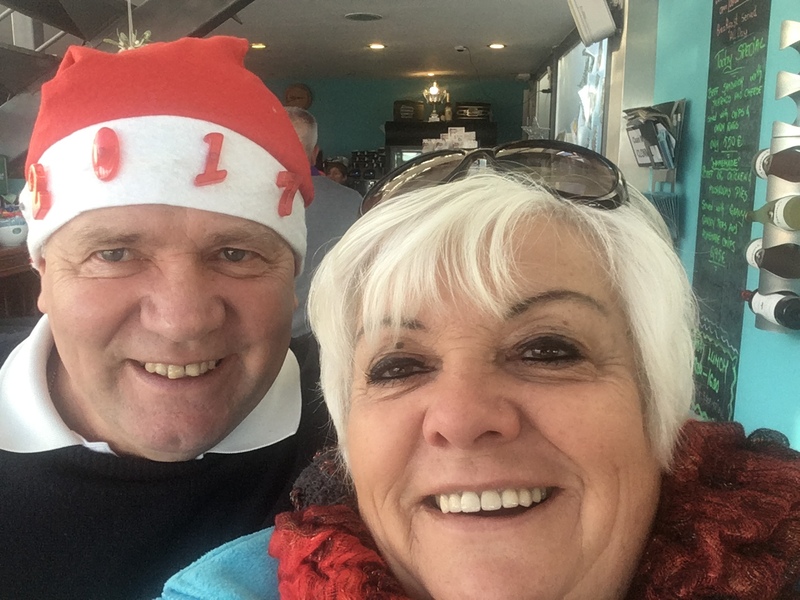 Was it Peter or the real Santa? 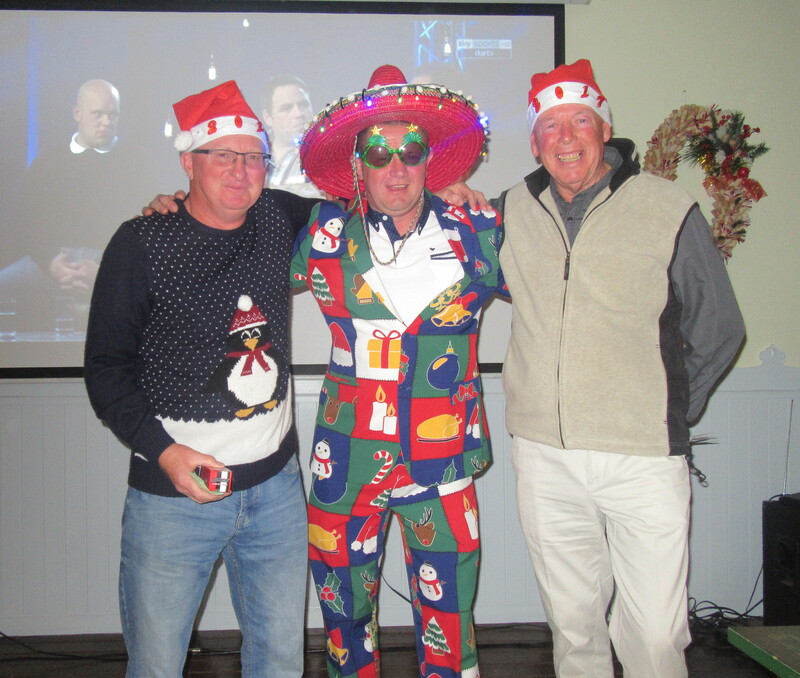 Mulled wine and mince pies were provided before the golf, and the society put on a buffet for golfers at the evening presentation. Thanks to Alicia and Ken who prepared the food, helped on the night by Tanya Busby and Lynn Simpson. Everything looked very Christmassy, but the thermometer (in the shade) showed 23 degrees. 31 players took part and the clear winner turned out to be Alicia. 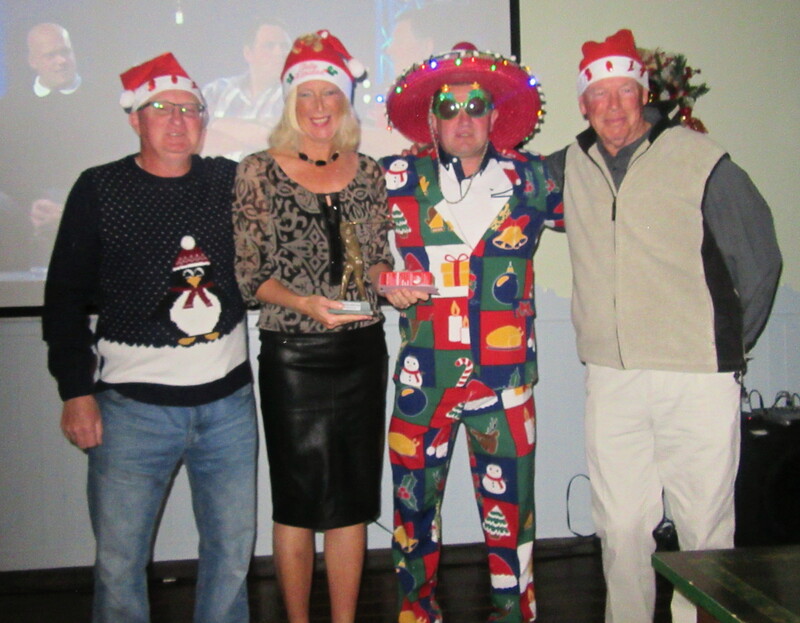 Alicia gets the trophy, but don’t they look silly wearing Santa hats? never seen anyone here before! 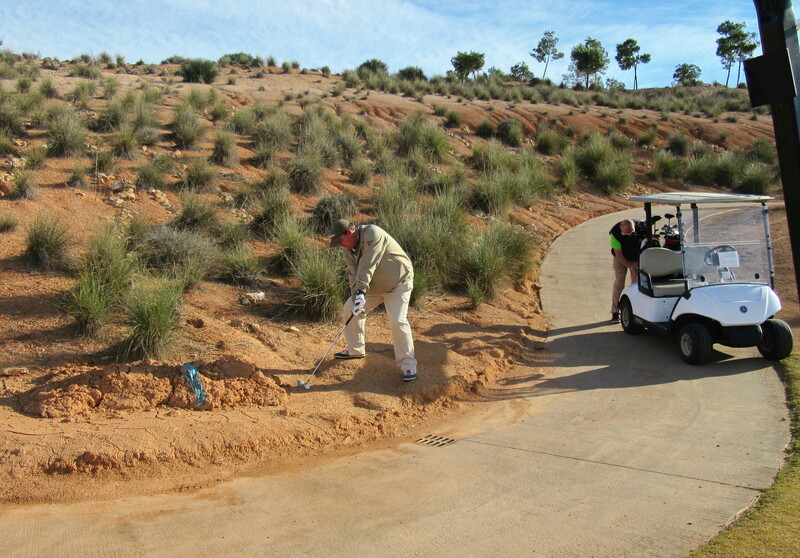 Jan Bosch cleared the par 3 11th by at least 50 yards! Some good photos (supplied by Lynn Simpson). Notice we had a celebrity helping out at the presentation – you can always rely on Ricky Comber to steal the show! > A mate of mine recently admitted to being addicted to brake fluid. 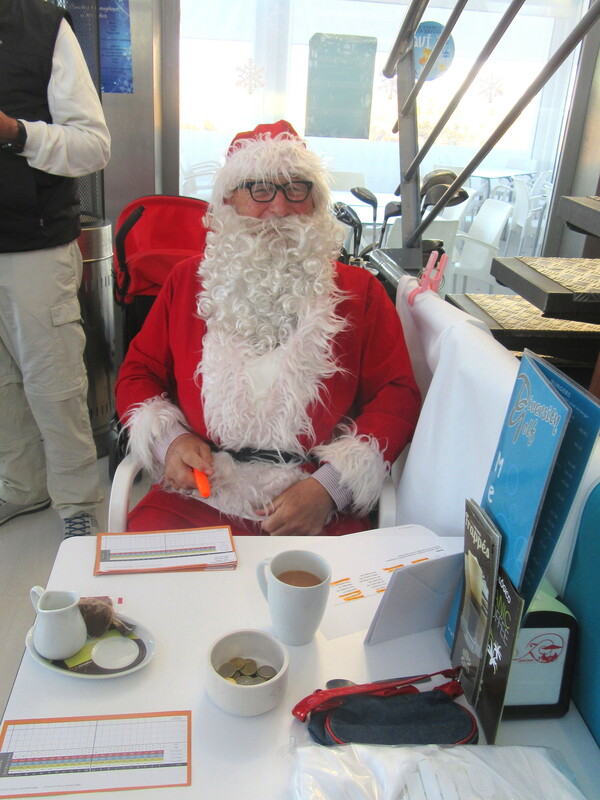 When I quizzed him on it he reckoned he could stop any time…. > I went to the cemetery yesterday to lay some flowers on a grave. As I was standing there I noticed 4 grave diggers walking about with a coffin, 3 hours later and they’re still walking about with it. I thought to myself, they’ve lost the plot!! > My daughter asked me for a pet spider for her birthday, so I went to our local pet shop and they were £70!!! Blow this, I thought, I can get one cheaper off the web. > I was at an ATM yesterday when a little old lady asked if I could check her balance, so I pushed her over. > I was driving this morning when I saw an AA van parked up. The driver was sobbing uncontrollably and looked very miserable. I thought to myself that guy’s heading for a breakdown. 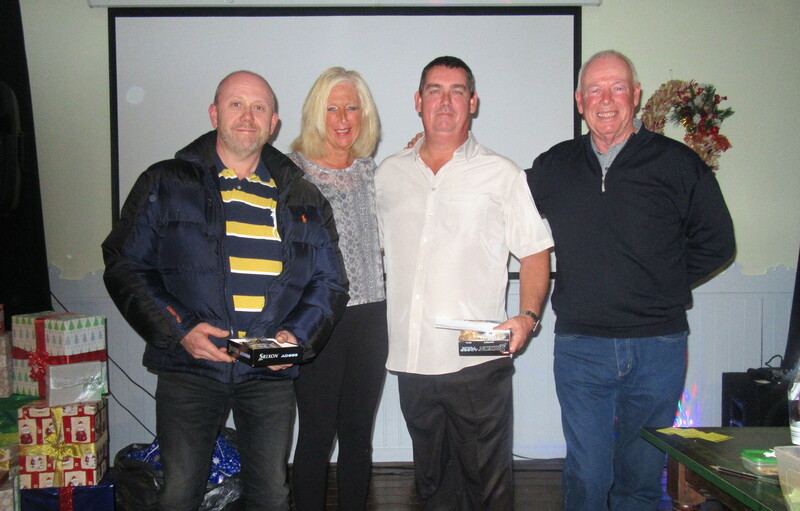 the winners were Mark & Neil…………….. 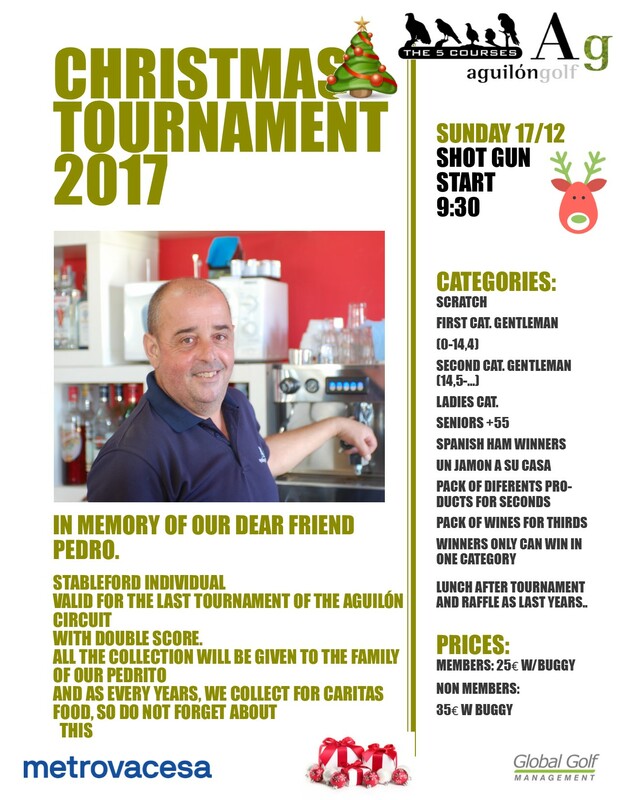 The serious competitions for 2017 are now over, just a friendly pairs competition this week, and then the Clover Christmas bash on the 22nd. Thanks to Lynn Bell for acting as starter this week. 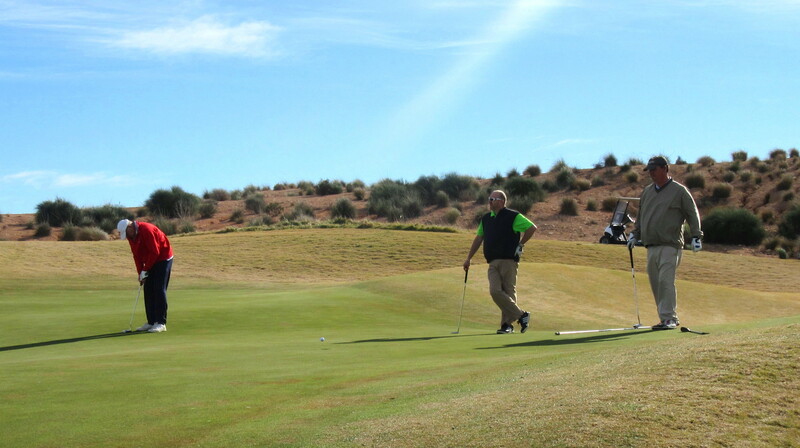 The forecast was for 22 degrees, but the tops only came off for one hole early on, and then the wind arrived to make scoring difficult for the 16 pairs. 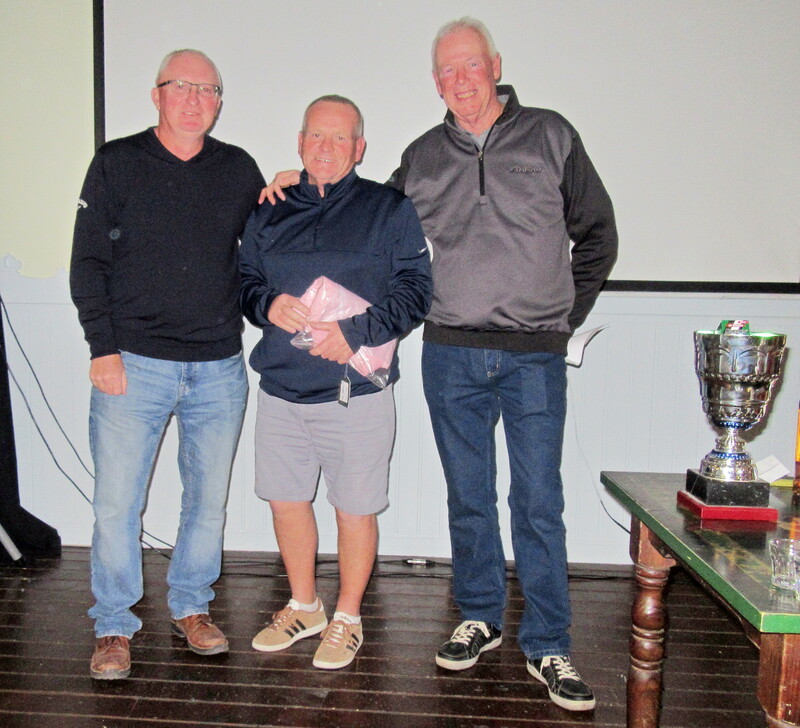 But Neil and Mark were runaway winners with an unbelievable 45 points – it was possible because they dovetailed perfectly with one of them doing the business at every hole. 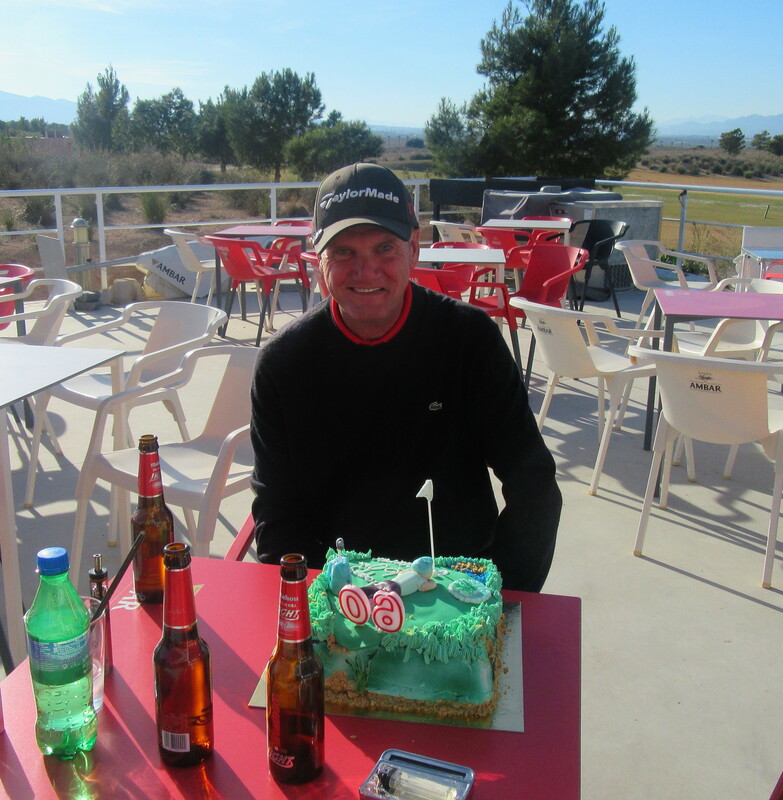 didn’t matter that Neil was in trouble at hole 4 – Mark made par for a net eagle! 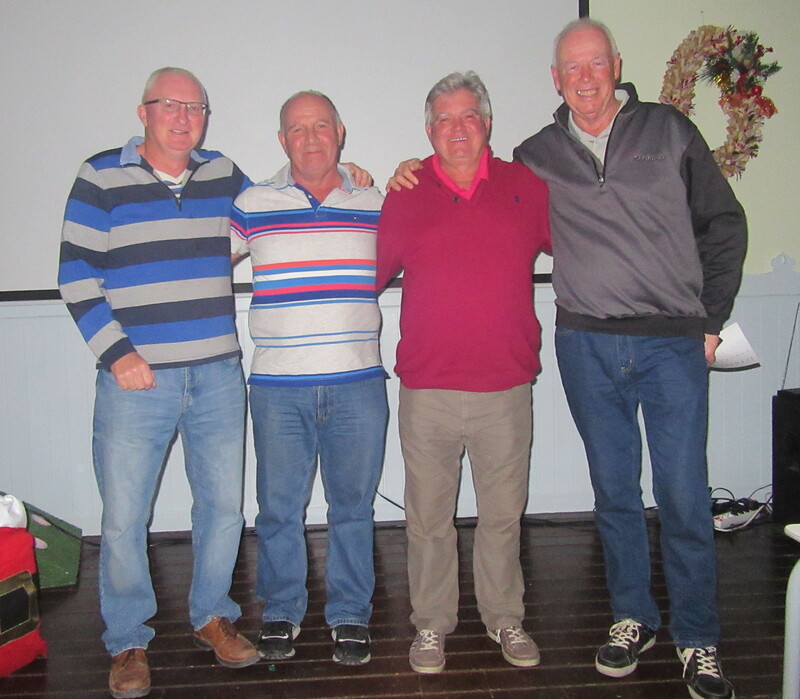 the winners watch my partner Don Henry putt out on the devil’s hole, number 10………..
Next week is the annual Clover Xmas special, a stableford with a twist – 2 gifts from Santa, one free throw at any time during the round and a mulligan (replay one shot you weren’t happy with!). Players must wear a Santa hat (provided). 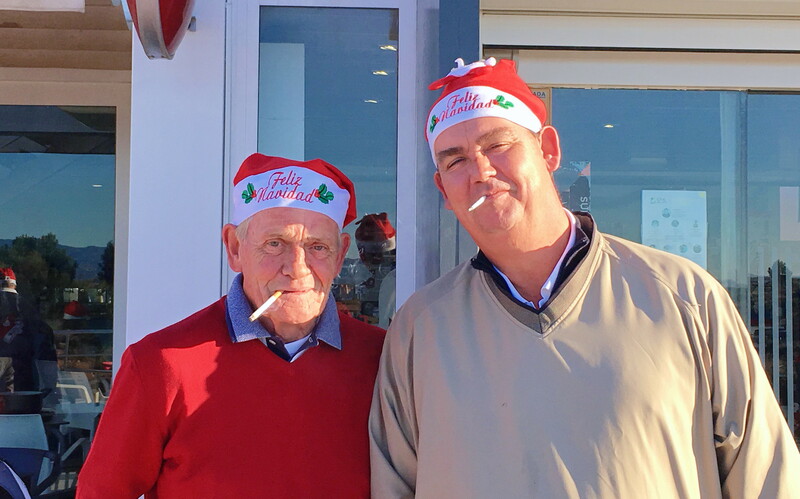 All arrive at the clubhouse for 09.15 for mulled wine and mince pies, and the society is putting on a small buffet for golfers at 7pm Friday night. He, who laughs last, thinks slowest. Torch: a tube for holding dead batteries. When you go into court, you are putting yourself in the hands of twelve people, who weren’t smart enough to get out of jury duty. 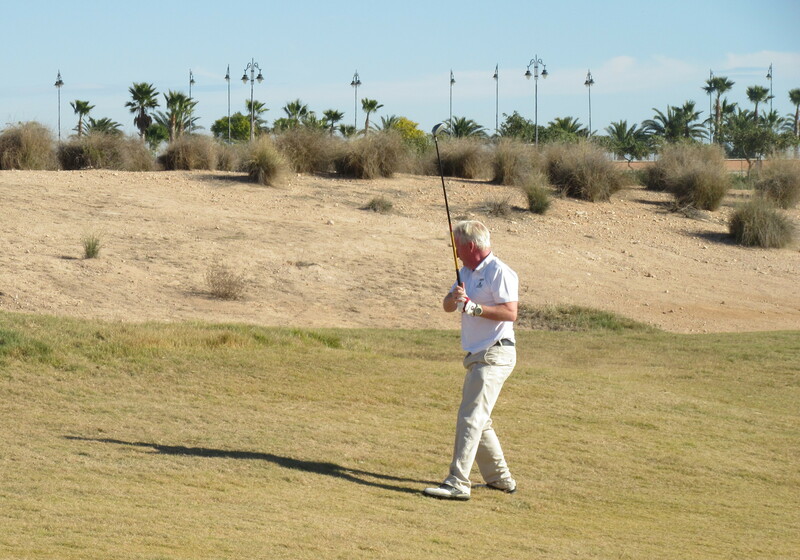 Chris King was the first of the leaders out, and smashed his first drive a long way down the middle………………….. The last Apollo Air of the year had 31 entrants and with only 2 ladies, no ladies prize. However, it was the deciding leg of the 12 competitions in 2017 for the overall champion (best 6 scores to count). 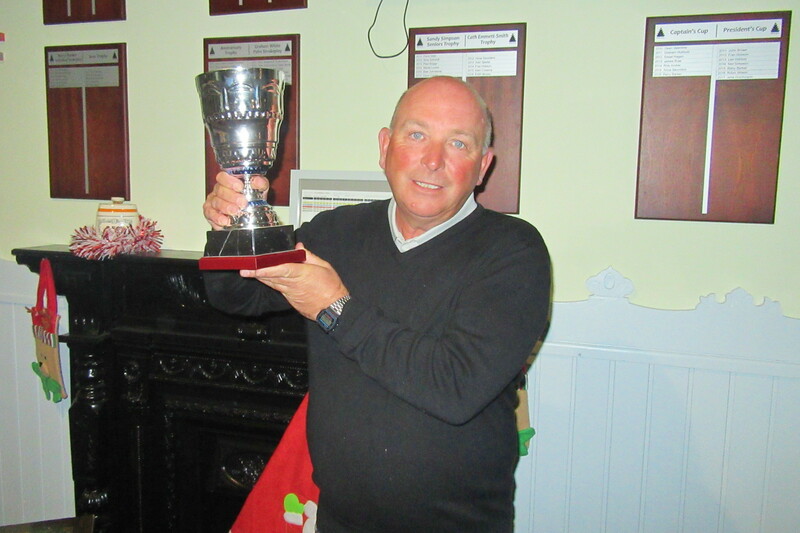 Chris King and Kevin Smith were tied after the November competition on 222 points with Chris McAllister and John Collins with an outside chance of overtaking the leaders. All four fought to the end, with Chris McAllister losing out with his 33 points. Kev thought he had done enough with 37 points and Chris King matched him with the same score. 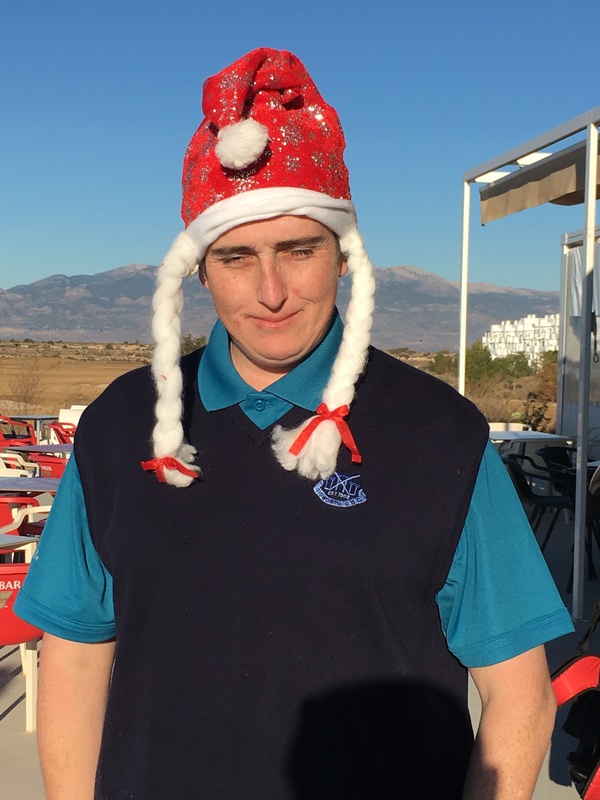 But it was John Collins who came from behind with 38 points, good enough to claim the first division prize on the day and amazingly improve his 6 scores by 10 points (lowest score drops off) to pip Kev by one shot! What a finish yesterday with the top 3 overall all having the best scores (bar 1) on the day. Chris King had a 2 on the 12th (par 4) – 290 yard drive followed by 85 yard sandwedge that pitched close and spun back into the hole. 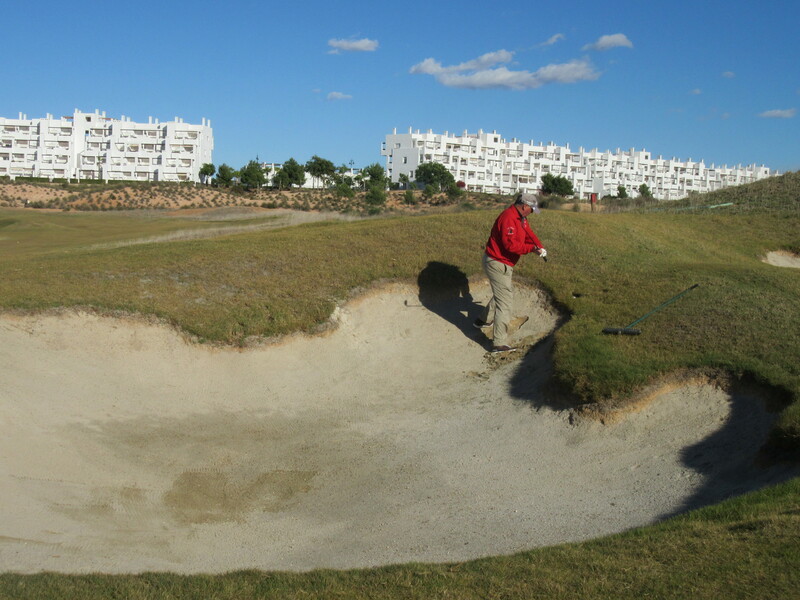 Followed by a birdie 4 on the next for 8 points in 2 holes, but still not enough to tiptoe over the finishing line. 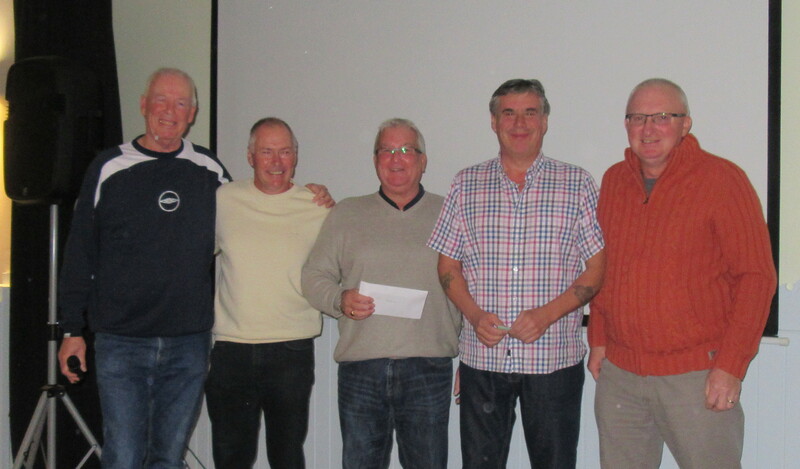 We mustn’t forget that it was also the monthly Apollo Air which was won by Terry Burgess – well done Terry! Thanks again to Barbara Rollett for acting as starter this week. 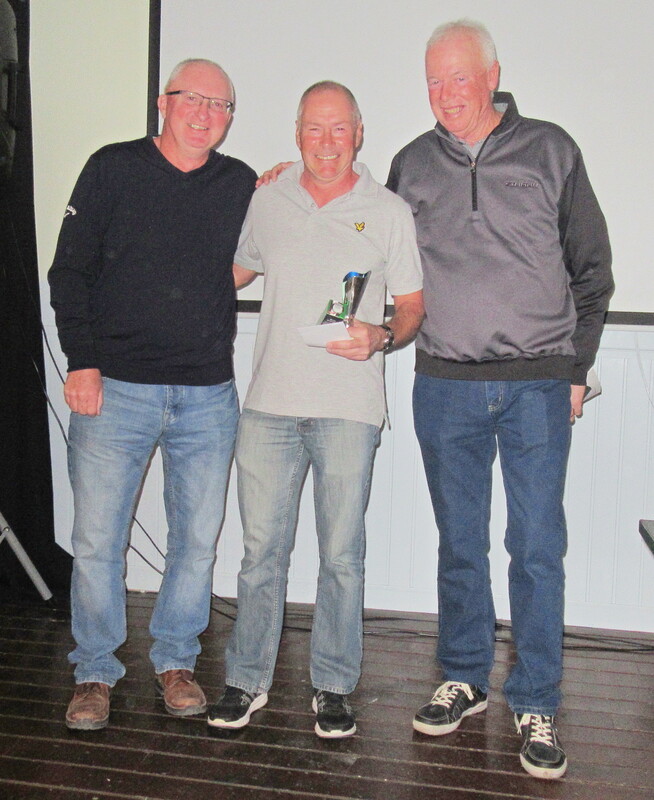 Terry had the best score of the day……………………..
Kev was leading all year and made a valiant attempt to hold on, but had to settle for the 2nd division prize on the day…………. Chris played so well, but could not add to his many other wins in 2017……….. 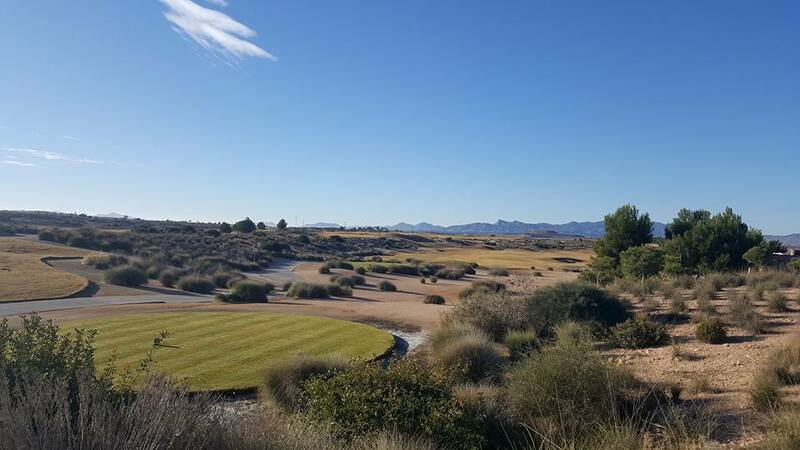 The course is looking really well as winter sets in (click the photo for a better view)………………………………. 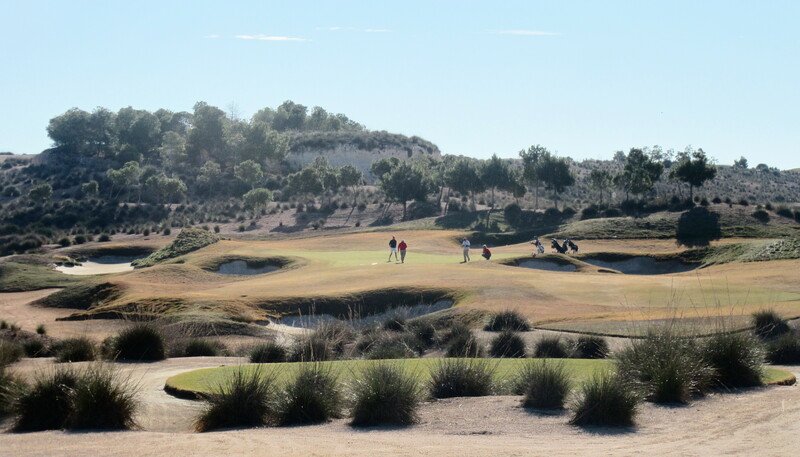 probably the best looking hole is the par 3 3rd………. 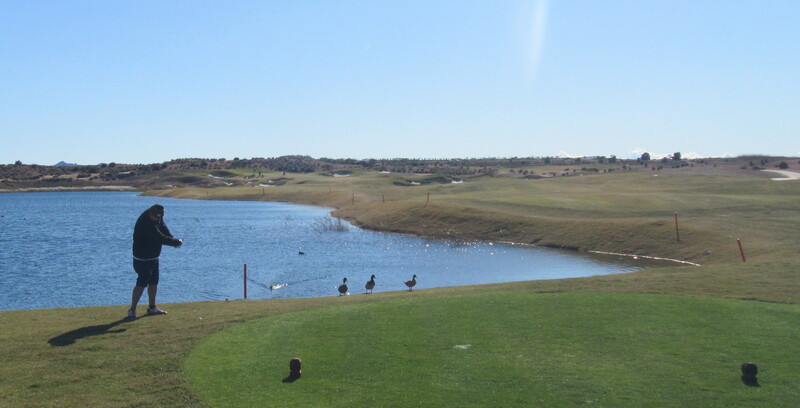 and a view across the lake to the par 3 11th from the highest viewpoint behind the 14th green……………. 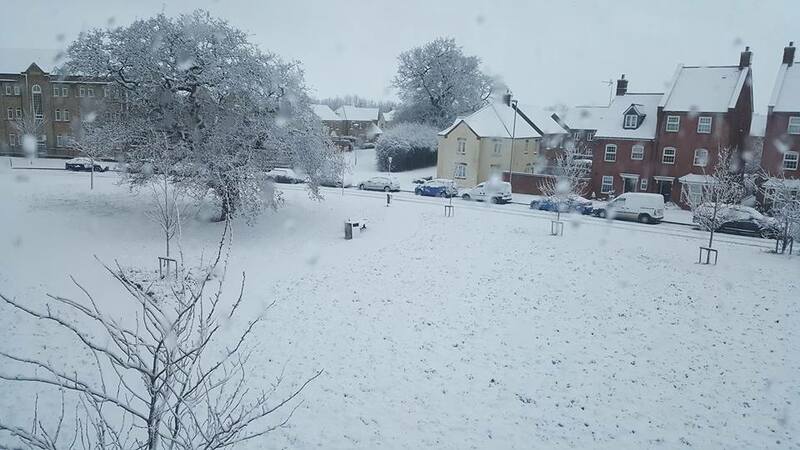 Thanks to Anthony Keating for these two contrasting vistas – Condado Saturday and Swindon (UK) Sunday! 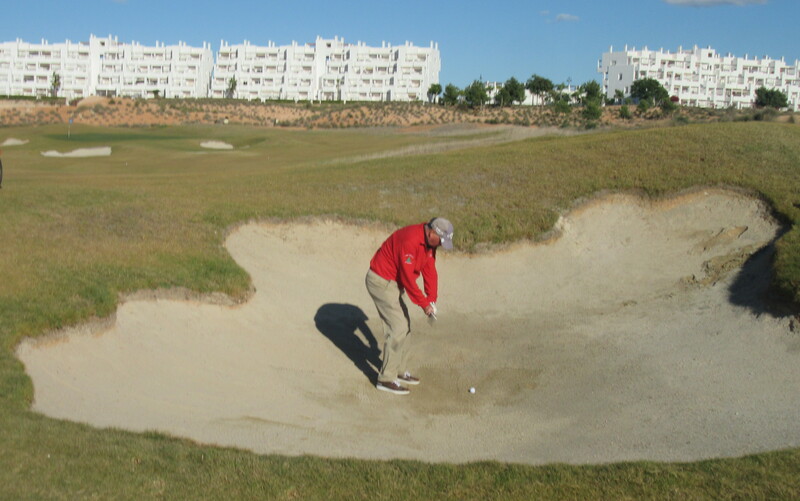 I am afraid that this week it is Pat Hughes who has been exposed playing a bad shot – on the 14th his ball was sat down in the first cut of rough, and after one of Pat’s ferocious swings it was still there…………………………. 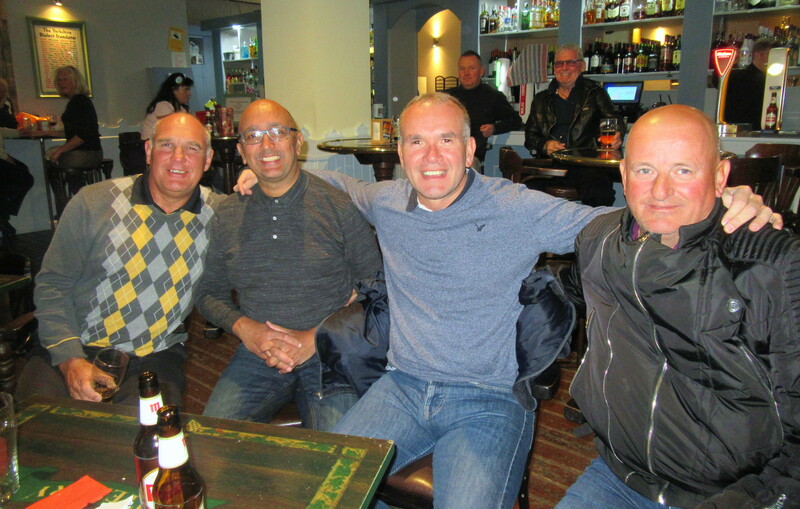 Daniel Don made up the numbers in this group of challengers for the ‘best of series’ but holed out for a 3 here on the 11th………..
Next week is a pairs stableford event. 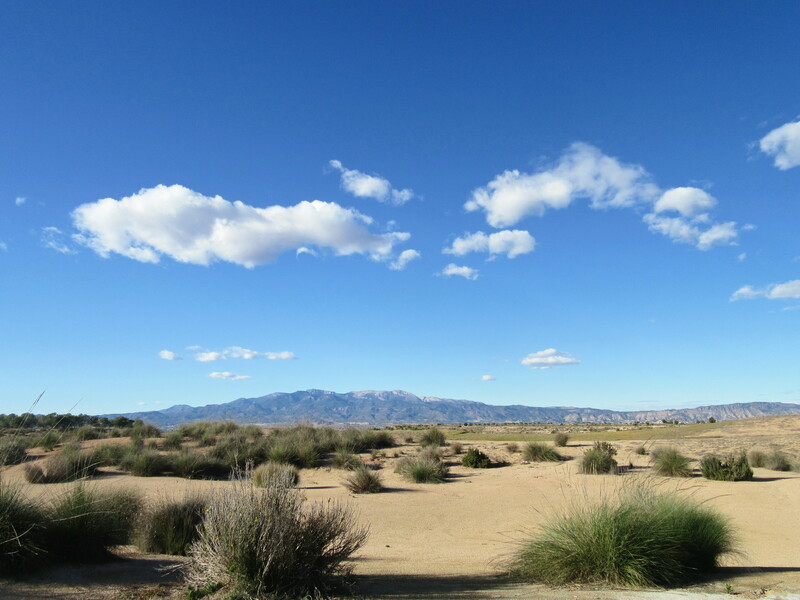 Clear blue skies but a bit windy and chilly – I am sure there are plenty in the UK who would swap with us! This week was a 4 person team with 3 scores to count each hole. A sunny (but windy) day with windproof tops or waterproofs required for the full round and in the bar after. Only 2 of the 11 teams managed to beat the par of 108 points. The captain’s team just triumphed due to a better back nine. Thanks to Barbara Rollett who acted has starter to give the committee a well deserved rest. 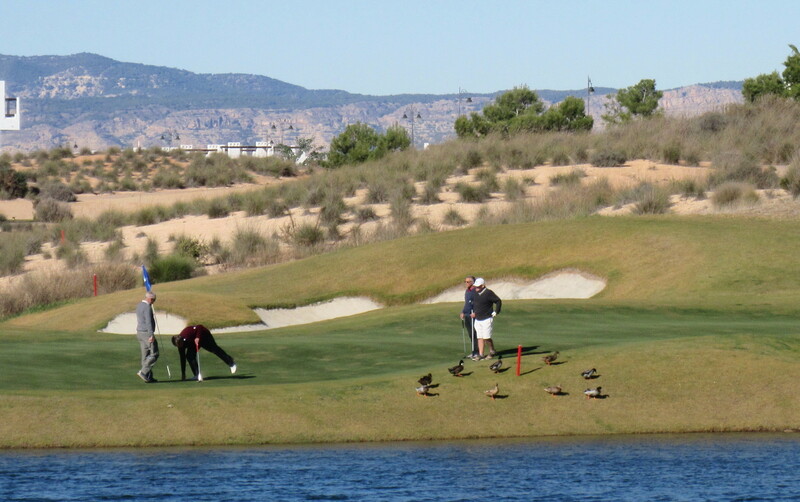 It was nice to see Dave Rollett back after several weeks, but his high handicap team (23, 23, 23 and pro Neil Simpson 22) weren’t good enough………..
the ducks obviously felt safer on dry land after me and Neil had bombarded them in the lake – here Neil plays his second ball from near the ladies tee on 10……..
then they swam to the 11th to see what the good golfers were doing……………..
Dave played well but was often so unlucky as the photos below show…………..
Dave R was so unlucky where his drive finished on 18……………..
2nd shot didn’t move – now playing 3rd from his own divot…………..
probably easier to put it here to start with………..
Maybe I should have video’d the action but I didn’t know what was going to happen, and fortunately there is no sound on these pictures! Next week is the final Apollo Air of the year, and we will find out who will take the annual trophy – good luck to the 3 or 4 players still in with a chance. If you want to know who they are, go to masterscoreboard and and look under ‘best of series’. All fixtures for 2018 are now on masterscoreboard, so I will not be including them on the blog this year under the fixtures tab. A significant change is the Ladies Day major has been moved to Friday April 6th (the week after easter) and the Pairs Strokeplay event is now on Friday September 14th. 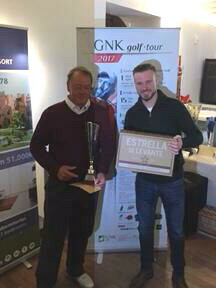 2 of our members won prizes at the 6th (and final) event on the GKN tour at Hacienda Requelme. 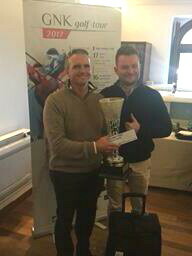 Chris King maintained his position as overall 2nd and won one year’s individual membership at the 6 courses. Also Paul Harrington finished in 2nd place on the day in category one. Well done to them both!